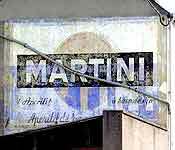 Martini & Rossi was born in 1863 out of an initiative of A. Martini, T. Sola and L. Rossi. 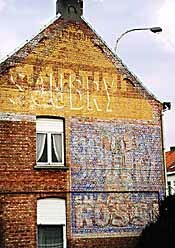 Many old panels show several layers and this wall is no exception. 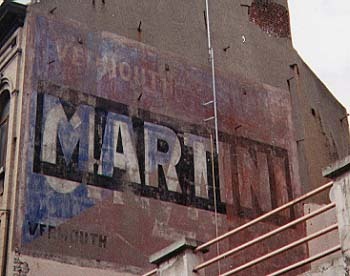 The bottom layer features the brands MARTINI and ROSSI. 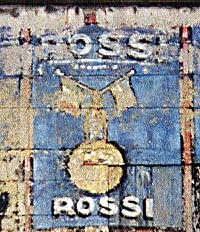 Rossi is in a much bigger type size than both the old Martini and the new Rossi. 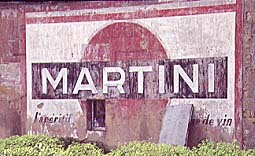 Martini is not repeated on the new version of the drawing. 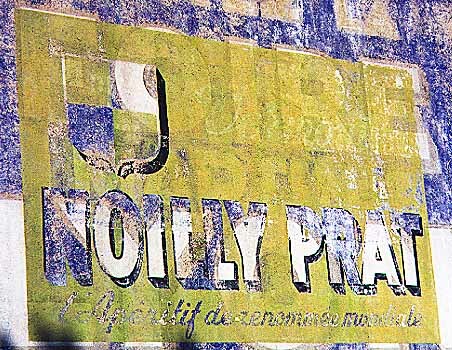 The words Apéritif à base de vin are probably leftovers from the previous version: the first and last character ('A' and 'N') don't fit on the new blue background. 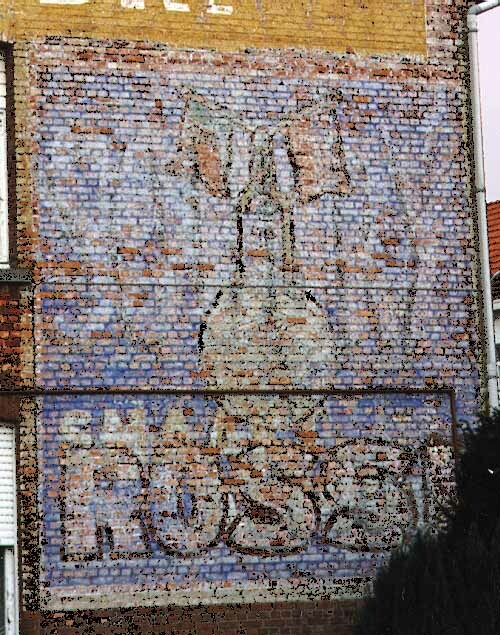 One last, important observation: the drawing repeats itself in the bottle above the beaming consumer. 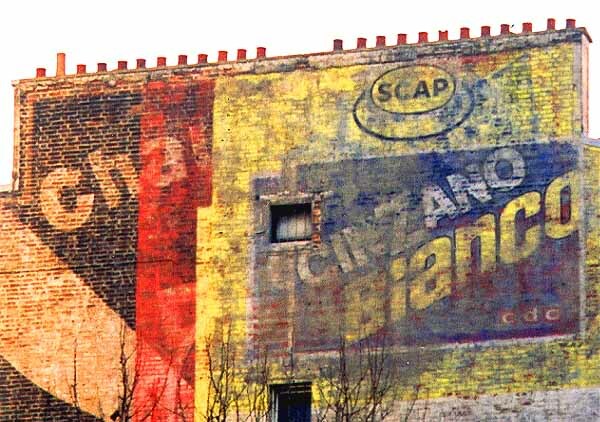 Don't miss the Italian flag! 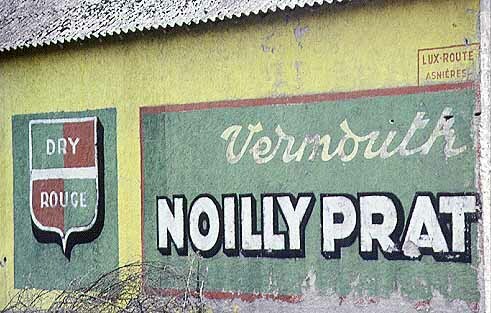 We have another, less elaborated, case in the Malagasy Vache qui rit, where in the earrings the whole is repeated. 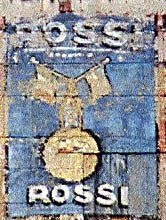 bottom: ROSSI with globe and bottle and flags, everything. Both panels also carry the Soubry brand. 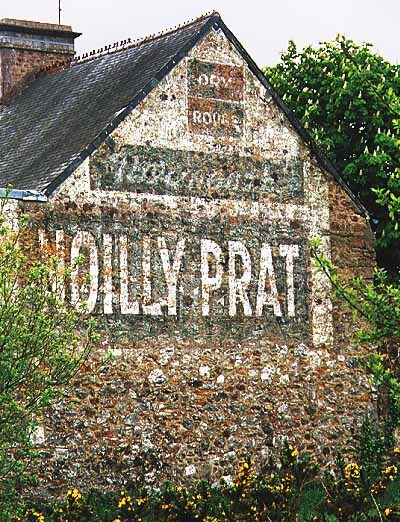 More about Soubry in the food-section. 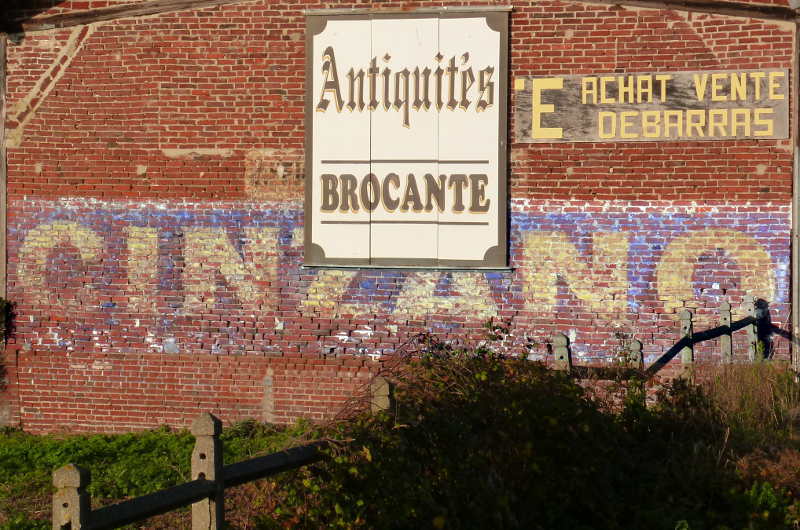 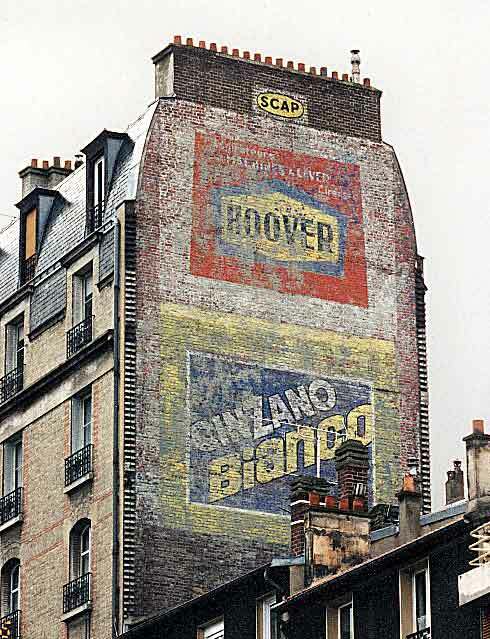 This wall on the Place du Jeu de Balles is living proof that painted advertise­ments are not considered worth preserving. 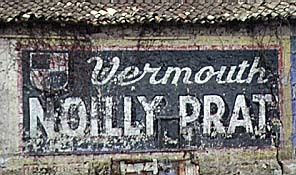 The top layer recommends frying-pans and other kitchen-utensils. 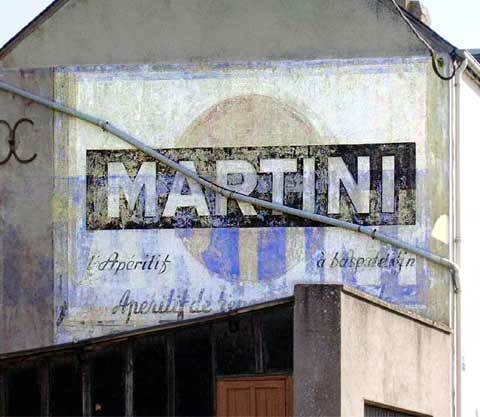 Behind the Martini an old BYRRH. 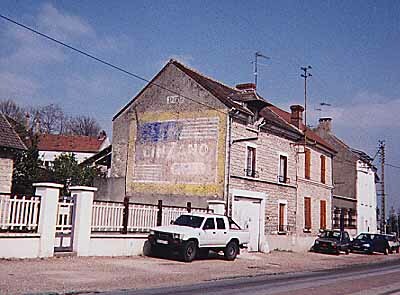 Don't miss the Pompes Compresseurs just below the top border. 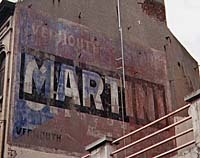 Two layers of the same brand. 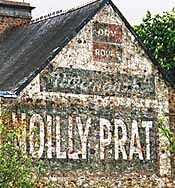 or Aperitif with world-wide fame. 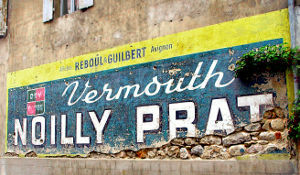 or Visit Lyon's fair in March. 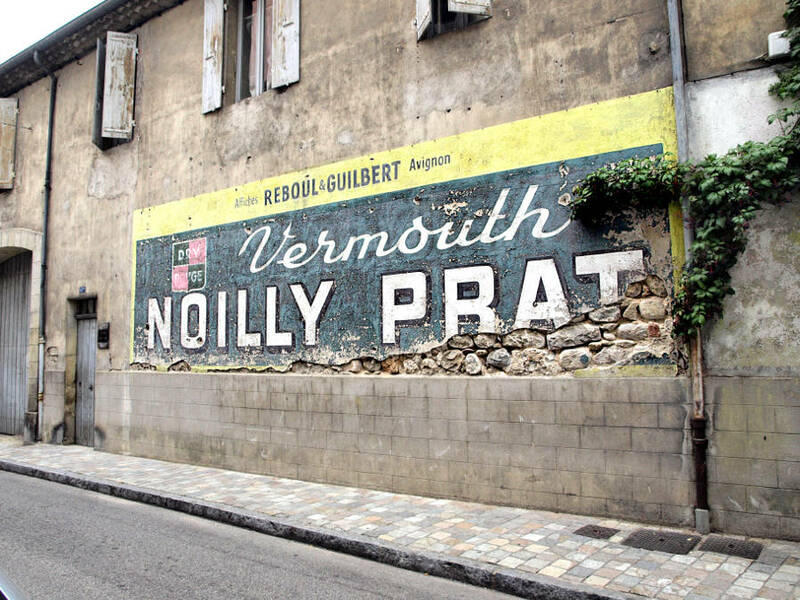 Notice that both the Vals-les-Bains and the Meyreuil walls were done by Affiches REBOUL & GUILBERT Avignon. 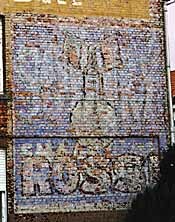 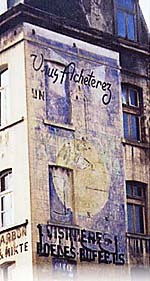 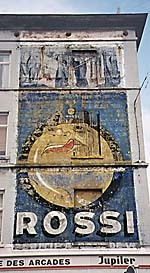 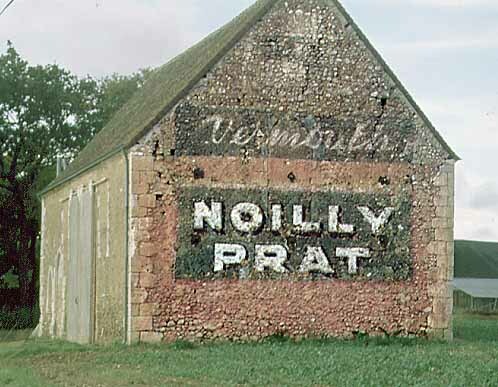 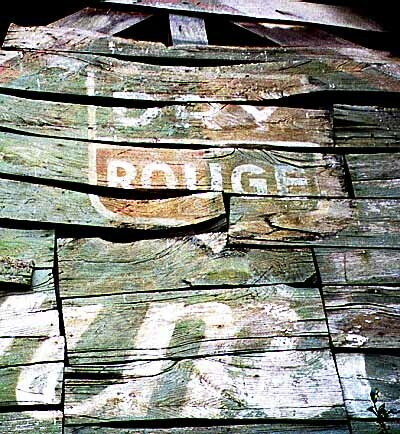 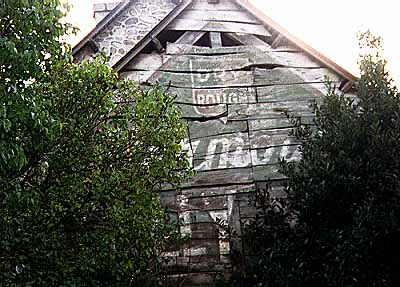 This Meyreuil advert is painted over an older mural for Le Petit Marseillais, a newspaper with a history. 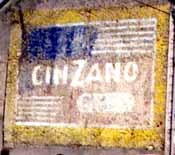 Cinzano's brand history dates back to the second half of the 16th century with Antonio Cinzano. 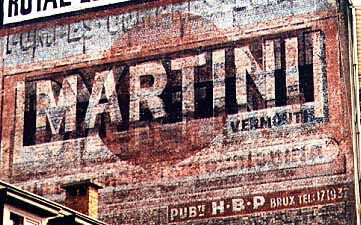 Two centuries later the brand was sold world-wide. 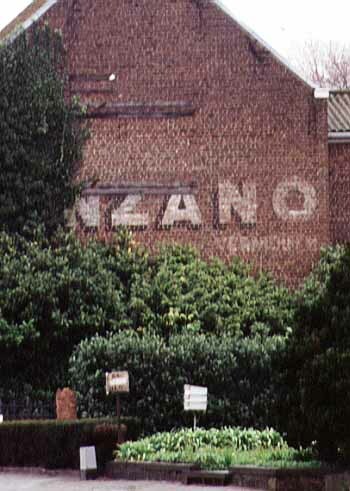 Cinzano became one of the most internationally known Italian brands. 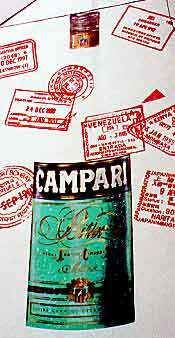 From the mid 19th century Campari be­came an important competitor. 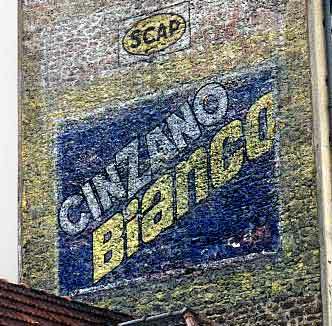 Eventually the Campari Group acquired Cinzano in 1999. 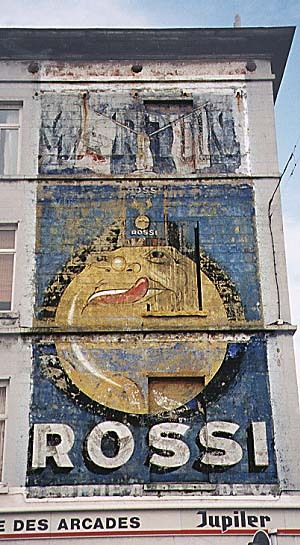 Both paintings are part of an advert covering opposite sides of the same building. 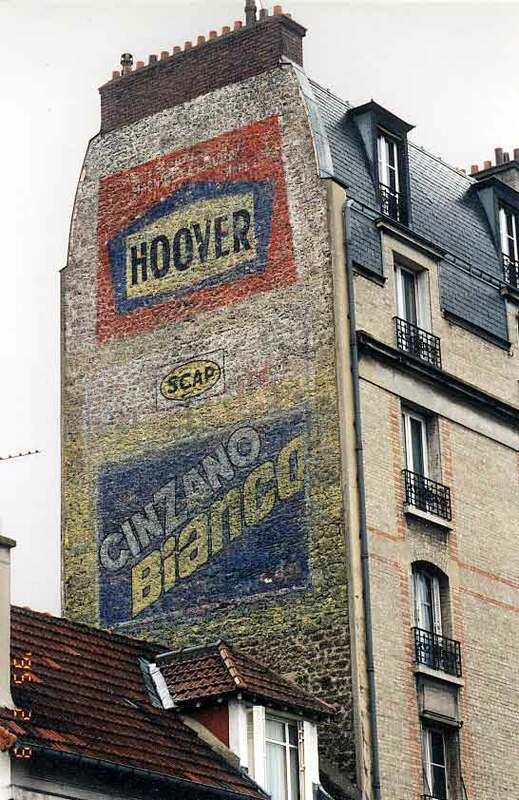 Cinzano shares the space with Hoover. 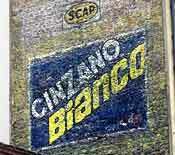 It's apparently quite difficult to squeeze the Bianco into the box. 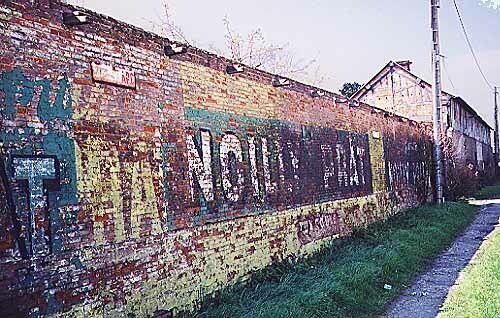 Have a look at both walls and spot the differences. 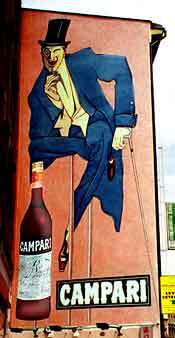 Gaspare Campari (born 1828) started mixing vegetarian ingredients when he was still a boy. 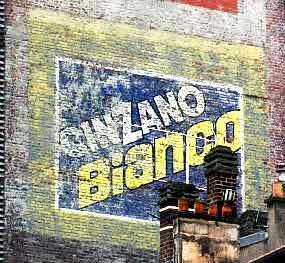 During the 1840s his concoction was sold throughout Italy. 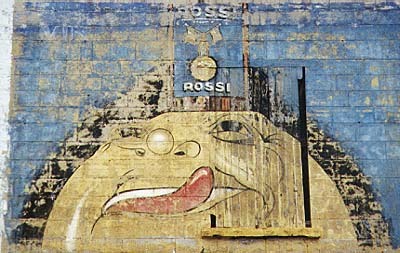 Some years later, in 1860, he founded the Gruppo Campari. 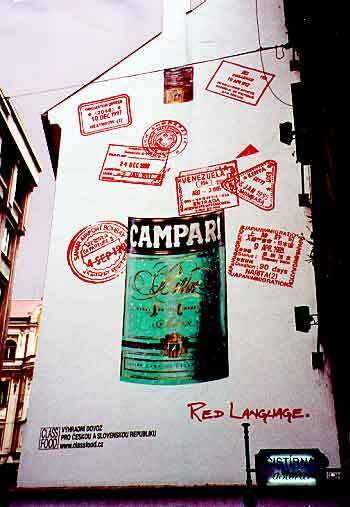 Campari began its international expansion during the 1920s. 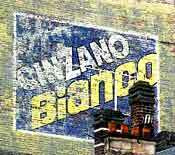 The group acquired many other brands: one of them was Cinzano.